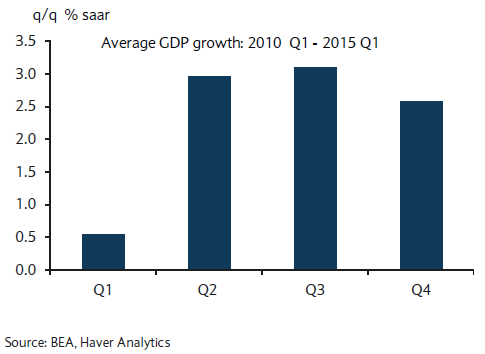 What’s the impact of seasonal adjustment on GDP numbers? What’s at stake: While seasonal adjustment is generally considered uninteresting, the repetition of low first quarter GDP releases since 2010 has led many to wonder if a predictable seasonal pattern remains in the published data. The U.S. Bureau of Economic Analysis is investigating the issue and will report on its findings in July. Jeffrey Miron and Joseph Beaulieu write that traditionally macroeconomists regarded seasonal fluctuations as inherently uninteresting. Economists at S.F. Fed write that the raison d’être of seasonal adjustment is to remove fluctuations in economic data that repeat at the same time and in the same fashion every year in order to reveal underlying cyclical and trend movements in the economy. Seasonally adjusted GDP estimates strip out recurring weather or holiday patterns that affect economic activity and make it much easier to observe that underlying nominal GDP growth. Martin Sandbu writes that the poor first-quarter growth results for the US caused a great deal of consternation. The official first estimate came in at only 0.06 per cent growth, or about 0.25 per cent annualized. That was much, much worse than the 0.6 to 0.7 average forecast. Justin Wolfers writes that the pattern of weak first-quarter growth has occurred so often that it has led some economists to ask whether there’s a problem in how the government calculates its G.D.P. numbers. It’s happening now. It happened in the first quarter of last year. And it happened in 2010, 2011 and 2012. Tom Stark writes that from 1985 to the present, half of the slowest intra-year quarterly growth rates occurred in the first quarter, and six of the 10 slowest growth rates over the entire period happened in a first quarter. Economists at S.F. Fed write that this regular, calendar-based statistical pattern is a puzzle because the BEA seasonally adjusts the GDP data to remove such fluctuations. First-quarter seasonally adjusted real GDP growth should not be consistently higher or lower than growth in any other quarter. The U.S. Bureau of Economic Analysis writes that despite regular reviews and updates, changes in seasonal patterns can sometimes lead to ‘residual seasonality’—that is, the manifestation of seasonal patterns in data that have already been seasonally adjusted. 1. After the detailed, individual components of GDP are seasonally adjusted, BEA aggregates the seasonally adjusted components to obtain total GDP. In some cases, seasonal patterns may emerge in the aggregate estimates that were not apparent in the individual components. 2. In some cases, the source data may be seasonally adjusted at monthly frequency, but in aggregating to quarterly frequency, seasonal patterns may emerge that were not apparent in the monthly data. 3. In some cases, the current-dollar values and prices may be independently seasonally adjusted, then the values are deflated (divided by the price) to obtain estimates of real expenditures. Seasonal patterns sometimes emerge in the deflated estimates that were not apparent in the current-dollar values and prices. Economists at the Federal Reserve Board write that residual seasonality is only one of many explanations – such as statistical noise, unusually harsh weather, and other idiosyncratic factors – that might lead one to discount some of the weak first-quarter GDP growth. Jason Furman writes that weak first-quarter growth partially reflects generally worsening weather over the past decade, which may not yet be accounted for in seasonal-adjustment algorithms. Tyler Cowen wonders if this seasonal contraction interacts with the real economy in a different way than before the Great Recession. Perhaps negative economic momentum, even when expected, chills other drivers of economic activity more than it used to. This could arise from complementarities, increasingly important thick market externalities, signal extraction problems combined with greater fearfulness, or perhaps it is revealing information about the fragility of risk premia. Justin Wolfers writes that the puzzle of the first-quarter slump seems to be confined only to G.D.P. There is no indication of similar problems affecting the seasonal patterns of other economic indicators. For instance, an alternative (seasonally adjusted) measure of economic growth called gross domestic income has not recorded an unusual number of first-quarter slumps. Likewise, there is no systematic difference in the quarterly pattern of seasonally adjusted growth in nonfarm payrolls. FT Alphaville reports that economists at Barclays suggest that this statistical artifactdisproportionately affects the figures for non-oil construction, exports, and defense procurement. Ever since the start of 2010, spending in these categories has consistently collapsed in the first three months of the year only to rebound in the subsequent nine months. Tom Stark writes that analysts have discussed a number of responses to what appear to be first-quarter effects in the BEA’s estimates for real GDP growth. Dawsey and Mischaikow (2015) prefer to construct an activity measure comprised of components that do not suffer from a first quarter effect. However, some analysts question the existence of a statistically significant first quarter effect (Edgerton (2015)), while others (Boldin and Wright (2015)) advocate weather-adjusting the data because they think severe weather in first quarters may affect the data in ways not captured by the BEA’s seasonal adjustment procedures. Stark focuses, instead, on the benefits of using signal extraction techniques for estimating real GDP growth, one example of which is the Federal Reserve Bank of Philadelphia’s GDPplus estimates. Economists at S.F. Fed applied a second seasonal adjustment to the BEA’s seasonally adjusted real GDP series to remove the residual seasonality in aggregate GDP. This second seasonal adjustment operates directly on data at an aggregate level and can be a useful supplement to the BEA’s bottom-up seasonal adjustment procedure that uses only disaggregated data. The application of second-round seasonal adjustment increases real GDP growth in the first quarter of 2015 from its initial published value of 0.2% to 1.8%. Taking this correction at face value, real GDP growth in the first quarter was stronger and much closer to the economy’s sustainable rate of trend growth. This article was originally published by Bruegel, the Brussels-based think tank. Read the article on their website here. Publication does not imply endorsement of views by the World Economic Forum. Author: Jérémie Cohen-Setton is a PhD candidate in Economics at U.C. Berkeley and a summer associate intern at Goldman Sachs Global Economic Research.